This page is a dedication to Kevin Satin, a very special boy who was my best friend on earth, and is now my best friend in heaven. Unfortunately, he was taken far too soon. Despite intense sessions of chemotherapy, and a bone marrow transplant from his brave sister Jenny, Kevin died of leukemia in an Iowa hospital on September 7, 1988, at the tender age of 10. I have never forgotten Kevin, and what he meant to my life while we were both on earth. 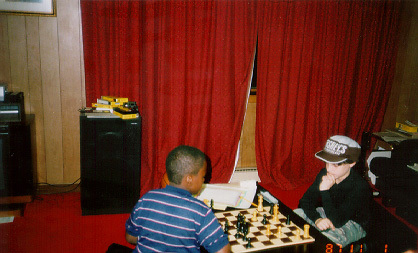 Throughout my chess career, I have dedicated some of my biggest tournament triumphs in his memory, and I have always kept him close to my heart. In addition to being an awesome friend, Kevin was also a very good student, and an outstanding hockey player. A memorium to Kevin that my family and I put in our high school yearbook can be found here. Here is a link to the Tomorrow's Children's Fund, the organization which was responsible for providing the Satin family with the resources and financial support that enabled Kevin to have his chemotherapy treatments and bone marrow transplant. Please support them and their mission if you can. In addition, Kevin's sister Jenny has teamed with the Leukemia and Lymphoma Society to raise money to fight blood cancer. Please support her if you are able. That's the kind of boy he was. Taken away without a warning."